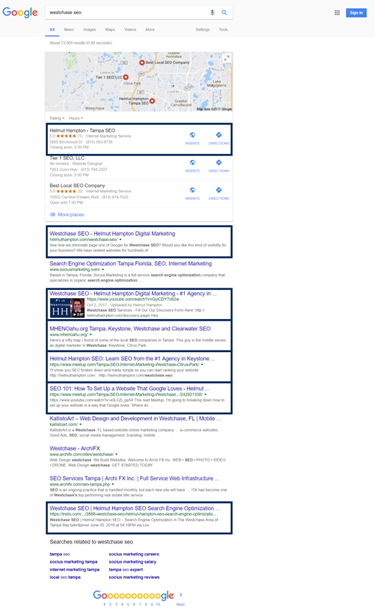 Best Tampa SEO Agency – How to Decide? 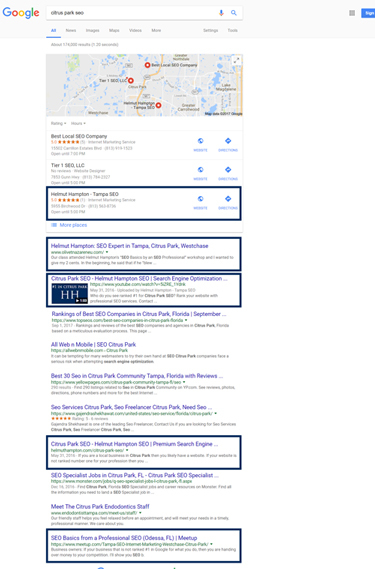 Home » Best Tampa SEO Agency – How to Decide? 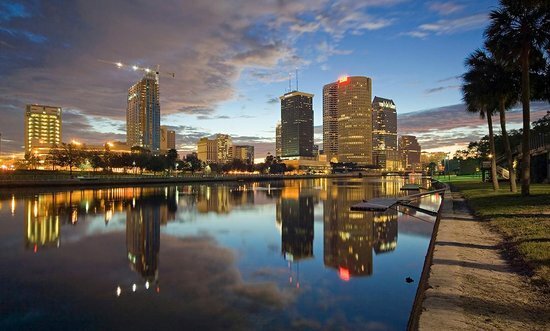 If you’re looking for the best Tampa SEO agency, then you have come to the right place. Of course, many SEO companies will tell you that they are the best. So, how can you really decide? In my experience in 5 years of doing search engine optimization professionally, I’ve found that there are two very important things that you should consider when evaluating SEO agencies. What does an SEO agency do? They get your website ranked on page one of Google, right? Well, a lot of SEO firms (especially general marketing firms that offer SEO on the side) don’t actually rank anywhere. This means that they do not have a website on page one of Google, which is the exact thing they expect you to pay them for! If they can’t rank their own site on page one of Google, then you have zero evidence of their ability to rank your site. If they can’t rank their own site on page one, why should you believe that they can rank your website on page one? If they don’t “use their own stuff” then why should anyone else? See, SEO is a huge industry now and everyone in Tampa (and the rest of the world) wants to capitalize on it. There is so much value in being found in Google, so business owners know how important it is. The problem is knowing who has the competence to get the job done. I find it baffling that there are actual SEO firms out there that don’t guarantee page one rankings! It just blows my mind. It’s like hiring a roofer and them not guaranteeing that they’re going to put a roof on your house. Or, paying a dentist and they don’t guarantee you’ll have clean teeth after a cleaning. You’re paying them to get you on page one, so not guaranteeing that is just crazy. The problem lies in that most SEO agencies are just trying to capitalize on a trend and have limited experience and competence in actually getting websites on page one. They might do some things that help with your website’s SEO, but they don’t have the skills and resources to get a website on page every time. And, that’s important… every time. If they can’t do it every time, then you’re taking a big gamble with your business. You’re potentially wasting thousands of dollars and months of time, only to end up on page 2, which is useless. This doesn’t even factor in the thousands of dollars of revenue that went to your competition who IS on page one. 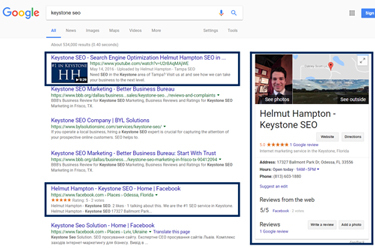 Helmut Hampton Digital Marketing guarantees page one rankings. If we sign you on as our client, we will get you on page one. Period. What about proof? We have plenty of proof of rankings. See these screens shots of us ranking all over page one for Keystone, Citrus Park, and Westchase. Another very important question you should consider when deciding who the best SEO company in Tampa is: do they have any testimonials? If you’re happy with a service, you’ll probably tell people about it. This is especially true if that service has transformed your business! Make no mistake, getting your business’ website on page one for the right keywords will transform your business. Our clients are very happy to provide us with testimonials and recommendations because we get their phones ringing off the hook. When we get them on page one, everything changes. So, of course, they want to recommend us and give us testimonials. You can see this by the amount of LinkedIn testimonials we have. We also have a whole page dedicated to those you can access from the menu at the top. 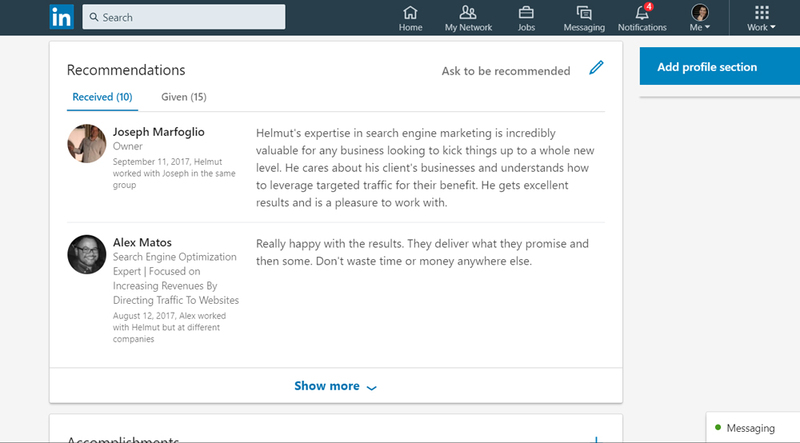 Just click on Testimonials from the Menu. So, if a company doesn’t have recommendations or testimonials? Well I wouldn’t call them the “best”, would you? If everyone says they are the best, how do you cut through the noise? Ask Google by seeing what they have ranked. Ask their clients by seeing what their clients say about them. Rankings don’t lie and you’re better off listening to an actual customer of a business. This is certainly more reliable than listening to 10 salespeople with each one trying to convince you that their SEO agency is the best. Just ask Google and what their clients say. Look at their rankings and their testimonials. To learn more about having the best do you SEO for you, see our page on website optimization consulting in Tampa.